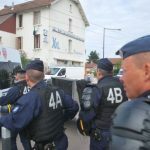 Yesterday (10/7/18) early morning French police, with assistance from border police evicted the XXL Squat in Dijon, where about hundred asylum seekers lived. During the eviction, twenty-four people were detained by the border police. 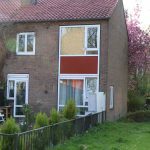 The eviction was enforced despite of the ongoing negotiations with the property owner. The building have been occupied since August 2016. Apart for providing home to many people, it also hosted a number of projects, including French language classes and legal assistance group, medical and social spaces. The offices space was empty and unused. Unfortunately, we are forced to get shelter in this way, because otherwise we have to roam the streets. the BBB is overcrowded and has a waiting list and in the Havenstraat only people with a Dublin claim are welcome. In addition, the Havenstraat is a former prison and that can be felt in the daily controls we must endure. Recently one of our members was arrested because he asked for food because of this diabetes and this was refused. We do not feel safe in such an environment and ask for 24/7 shelter. There are municipal plans to realize this 24/7 for undocumented people, but that will certainly take until end of the year before it is realized. We would love work and rent a house ourselves. The We Are Here group lost in court and can be evicted from their new place in Amstelveen from midday today onwards. 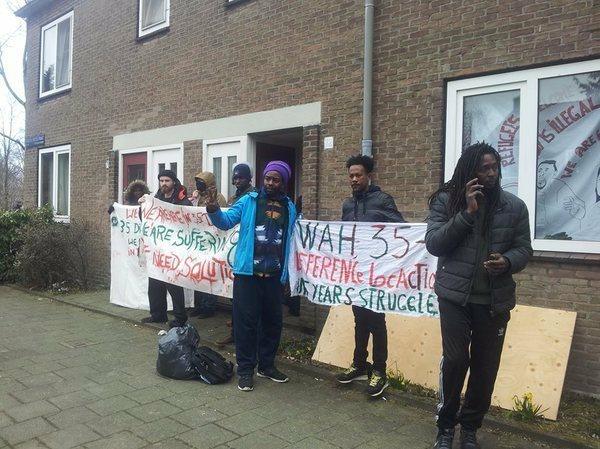 Generation Identity fascists claimed to have squatted an apartment next to the “We Are Here” refugee squats in Amsterdam. Squatted or not, the fascists had to leave after antifa activists attacked the fascists in their “squat”. Today, an extreme right-wing organization called Identitair Verzet has taken possession of a house in Rudolf Dieselstraat, simply to provoke. They have announced their intent to do so a few days ago on their website. We are very startled by this and find it completely unacceptable. 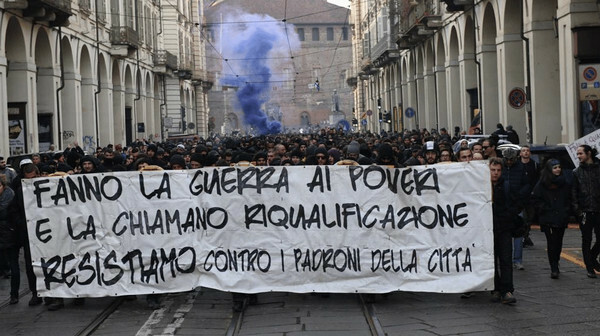 After all, we are looking for housing and a way to survive, while this group is clearly looking for conflict. Two weeks ago our banner on the church at the James Wattstraat was set on fire by Peter van Vliet, a member of Identitair Verzet. The next morning Van Vliet came to the Rudolf Dieselstraat to try to burn a banner here again. We called the police to deal with the situation, but they chose not to arrest Van Vliet. Despite evidence that he set the banner on fire, and also while the police caught him on the roof of our office, they wanted to “not let the situation escalate,” and let the arsonist walk away. 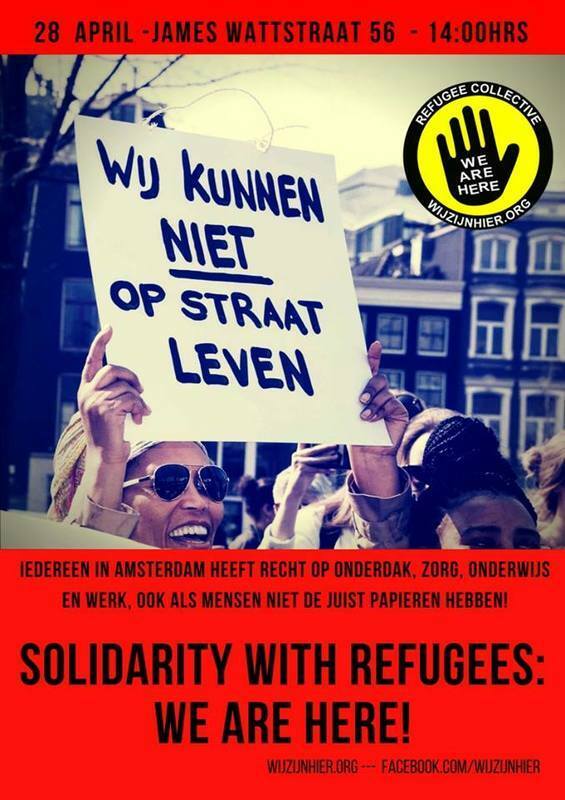 Amsterdam: April 28th, Demonstration Solidarity with Refugees, We Are Here! Saturday April 28th 2018, Demonstration Solidarity with Refugees, We Are Here! 16:00 arrival at Jonas Daniël Meijerplein. 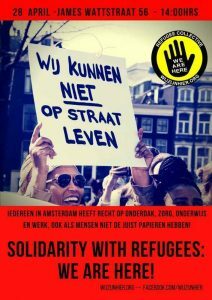 We Are Here, the refugee collective based in Amsterdam, has been campaigning for years against the inhuman Dutch asylum policy. 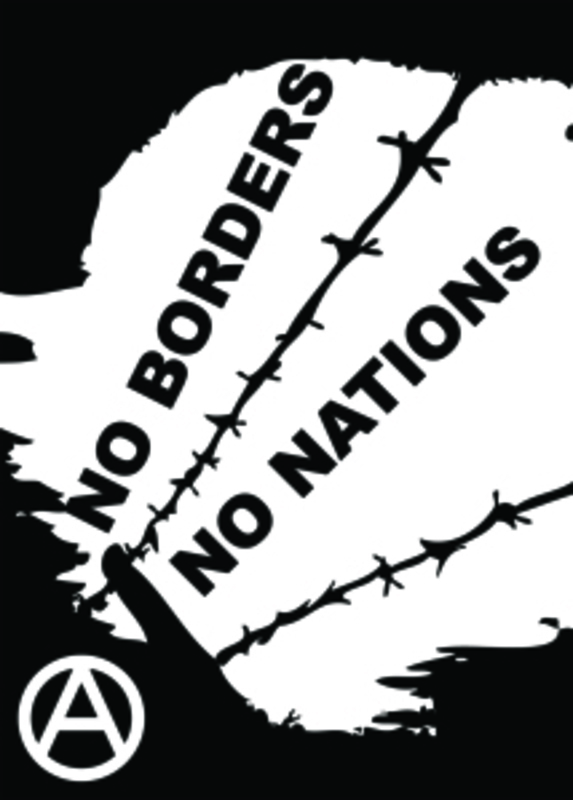 The refugee asylum policy is not conclusive, which leads to the denial of basic rights of refugees in the Netherlands. Many of them are unable to return to their home country, leaving them in limbo and without a proper roof over their heads or the care they need. We Are Here is squatting to show the inhumane situation in which they live and to ask for attention for the situation of refugees whose asylum requests have been denied but who can’t be deported. Time and time again We Are Here is being evicted, putting them out on the streets and back into uncertainty again, without any prospect of permanent shelter. Hello everyone! 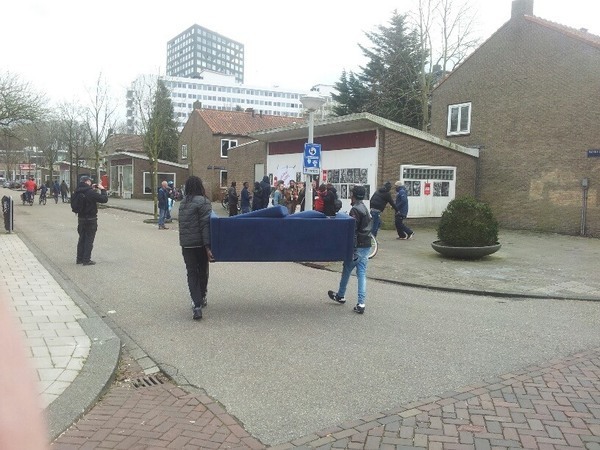 We would like to inform you that we have today successfully squatted 6 houses in the Rudolf Dieselstraat. We also have good news: after five years and for the first time, we have opened an office at Rudolf Dieselstraat 6. You are welcome at the We Are Here Village, next to Frankendael, under the Ringdijk. We are also looking for volunteers and home items such as blankets, furniture, mattresses and more. 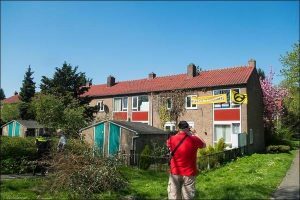 Ymere, the owner from the whole Rudolf Dieselstraat, has neglected the street for many years and wants now to hand it over to Camelot, a property guardian company. Together with the renters still living there, we are going to make a nice village of the street. 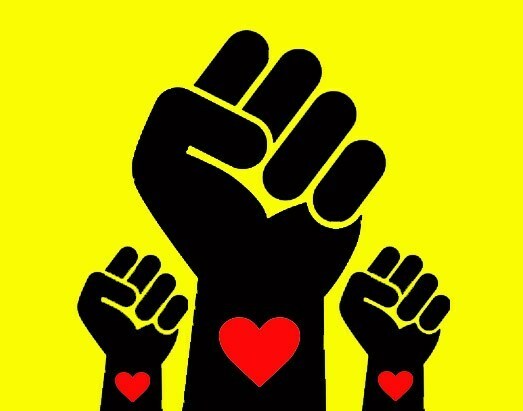 Refugee collective We Are Here has squatted a house at Rudolf Dieselstraat 72 for a woman and two children, together with people who now live under harsh circumstances in the church in the James Wattstraat. After more than 5 years of fighting for a normal life, we know what it means to live on the street or to continuously move from one place to another. It means that you loose all the time, your life looses sense, you are affected. Six of us have already lost their life. The pressure is rising. A solution has to come now. The women’s building on the Burgemeester Roëllstraat 70, where 25 women of We Are Here are living since a year and a half, can be evicted by the housing corporation from the 10th of April. Most political parties have agreed that no building of We Are Here will be evicted as long as they negotiate about the new board. We invite them to work together on a stable place and a real Amsterdam-style solution. On march 7th, at 7am, a few hundred riot cops evicted refugees occupying the Censive building and the Château du Tertre, at the Nantes university. 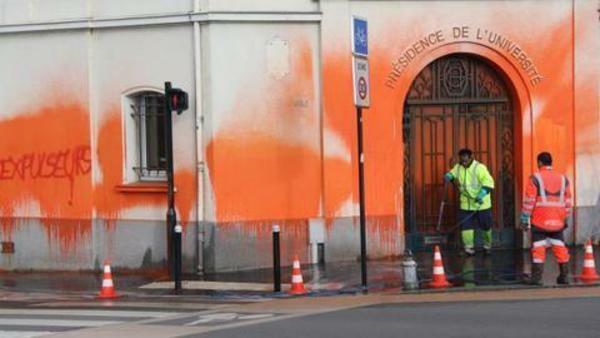 Around 50 people from Censive and 60 others from the Château were violently kicked out under the smiles from the heads of the university and authorities in charge of the police operation. The eviction was fast. One person went on the roof to protest. Around 10am, this person was still there. 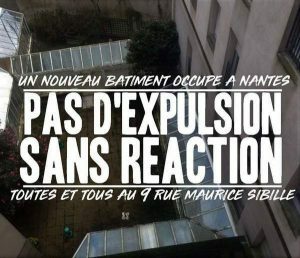 As soon as the eviction alarm was called, people gathered on the parking next to the Château du Tertre. All belongings were moved out by Demeco, a removing company, who did not want to communicate what they were going to do with the mattresses. The police started to barricade the Château du Tertre from inside to prevent any new occupation.